Why people eat, and how they eat, often matters as much as what they eat. Learn about healthy eating behaviour, and warning signs of disordered eating. Conditions such as anorexia and bulimia are well-defined examples of eating disorders, but some types of unhealthy eating patterns are more subtle. Give some thought to healthy eating behaviour and why we eat the way we eat. 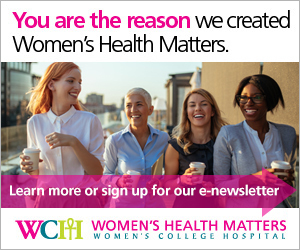 “Disordered eating represents any problematic eating behaviour, from eating too much to eating too little, or anything in between that would go outside of what we would consider a normal healthy intuitive eating pattern where you eat when you’re hungry,” says Dr. Valerie Taylor, psychiatrist-in-chief at Women’s College Hospital. People approach food and eating in different ways, and have different eating behaviours triggered by different factors – sometimes not triggered by physical hunger. “There’s emotional eating, there’s chaotic eating, there’s the chronic dieter, there’s restrictive eating, there’s the clean-your-plate eater,” Dr. Taylor says. She notes that we have lots of terms for unhealthy eating patterns, but we don’t have many terms for healthy behaviours. She uses the term “intuitive eating” to describe a pattern of eating in which people eat when they are physically hungry. However, she notes that intuitive eating isn’t always easy – especially in today’s environment of strong media images that promote unrealistic or unhealthy images as healthy and ideal; and at the same time push people to overconsume. “Girls see pictures of very thin individuals and think that this is what they have to emulate to be successful and to be popular, when a lot of times these images themselves have been so airbrushed that they’re nobody’s normal – not even the people in the pictures look like the pictures,” Dr. Taylor says, noting that the other side of message – overconsumption – is driven home by things like Tim Hortons’ new cup sizes. If you’re unhappy with your eating habits, spend some time thinking about what aspects of eating you’re not happy with, such as when you eat, where you eat, what you eat or how you eat it. “The first step is figuring out what you want to fix and what you’re unhappy with,” Dr. Taylor says. One simple step is to slow down – literally. Busy lives means everything gets rushed, including eating. Stretching mealtimes out a little longer may mean you don’t want that dessert, because you’ve given your brain and stomach that necessary time. Another effective tool is keeping a food journal to track what you actually eat and drink. Eating behaviour can be changed, but like any behavioural change, it takes work. Learning what aspects of your eating behaviour may need attention is key to making changes. If your lifestyle is such that you skip breakfast and do most of your eating at night, or if work functions force you to eat out a lot, you need to know that. Figuring out those factors can be time-consuming, but it’s a crucial step – one that people often skip when they jump into a weight-loss program or try to change their eating habits. “It takes a while to identify our patterns, our behaviours, our triggers, and to then work on ways to modify them,” Dr. Taylor says, adding that we often developed those habits for a reason. That means that changing those habits can take time and effort, even if it seems like a small change, such as eating breakfast. For someone who doesn’t eat breakfast, incorporating eating breakfast is a big deal, Dr. Taylor explains. It may mean changing the time they get up, which can mean changing the time they go to bed. It may affect what other activities they’re able to do in the morning, which may mean reorganizing tasks: they may have to pack children’s lunches the night before instead of in the morning to make time for breakfast, and that may displace an evening activity. It may not be as simple as it sounds. Any of these factors can be a sign of problematic eating behaviour. To read more about eating disorders, visit our Online Mental Health Centre.